Compiled by: Sri Biman Baruah, a resident of Gokuldham ONGC Colony, Film City Road, Goregaon(East), Mumbai-400063. 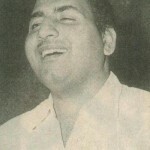 If there are 101 ways of saying ‘I love you‘ in a song, Mohammed Rafi Sahab knew them all and much more. The friskiness of teen romance, the philosophy of unrequited love and the anguish of heartbreak – he could explore every crevice of ardor in the most effortless and unmatched manner. Hindi film music is firmly embedded in gentleness and romance. It is difficult to listen to the songs of earlier times without the beauty of love creeping into your heart. You go softer than you really are; you imagine what you can’t really have, and for a few beautiful moments, there is a suspension of the usual anxieties and fears that accompany us like shadows throughout our lives. 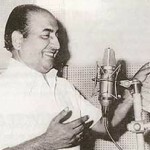 You are currently browsing the Rafians tribute to a true Maestro – Mohd Rafi weblog archives for January, 2012 .